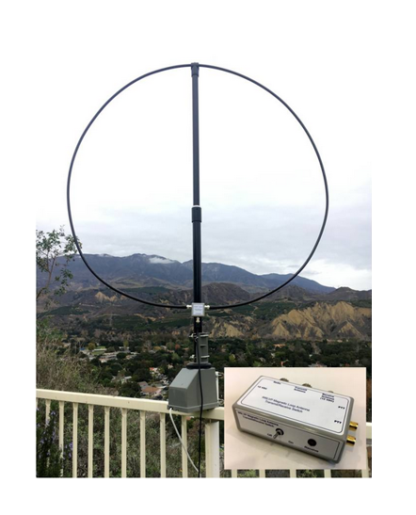 View cart “W6LVP Amplified Receive-Only Magnetic Loop Antenna – With T/R Switch” has been added to your cart. The Wellbrook Model ALA1530LN-2 and DX Engineering (Pixel/Inlogis) Model RF PRO-1B magnetic loops are both good amplified receive antennas. However, they are both expensive and difficult to connect to a transceiver lacking a separate receive-antenna input. 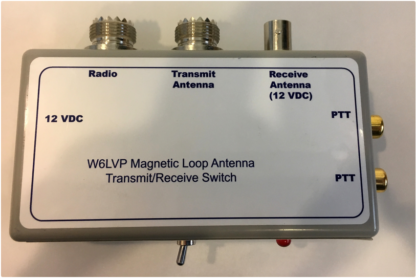 At $345 and including transmit/receive switch, the W6LVP loop addresses both of these issues. Shipping the Wellbrook antenna from the UK to the US adds another $100. Extensive side-by-side testing of the Wellbrook, DX Engineering, and W6LVP receive loops was compiled using simultaneous WSPR signal-to-noise reception reports on all LF, MF, and HF amateur bands. In addition, extensive laboratory bench tests were also performed. In both test regimens, all three antennas performed very well and without significant difference. 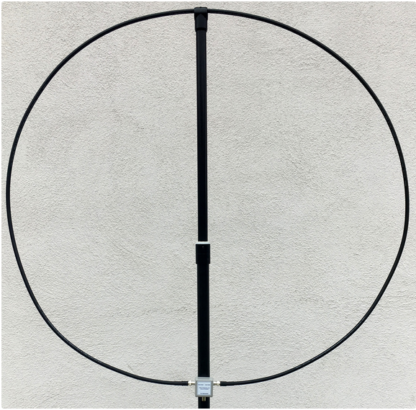 The W6LVP loop antenna system at $345 including a transmit/receive antenna switch is the best value. If your rig has a separate receive antenna input, checkout my antenna for you. If you live in the shadow of one or more powerful AM broadcast transmitters, contact me for information on a solution for you. Please reach out to me via CONTACT with any questions. 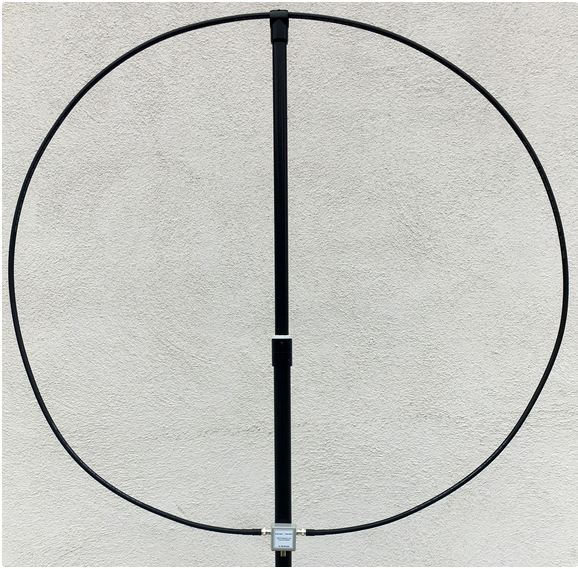 The W6LVP mag loop is a complete receive antenna system delivering top-of-the-line performance to amateur radio operators and SWLs. Particularly for those with space and/or budget limitations. It is a great complement to small vertical or wire transmit antennas. You have a knob to turn up the power but don’t have one to turn up the received S/N. Includes a low-noise, broadband amplifier covering 2200 (135 kHz) through 10 meters (30 MHz) with no tuning or adjustment. Great for contesters to quickly check all bands. Greater coverage is possible at reduced performance. Light-weight antenna support fabricated from furniture-grade PVC yields a strong but very light antenna weighing only 2 pounds (not including transmit/receive switch or power adapter). Great for both portable/camping as well as fixed installations. Light weight and small size make for lower shipping cost – particularly compared to shipping from the UK. 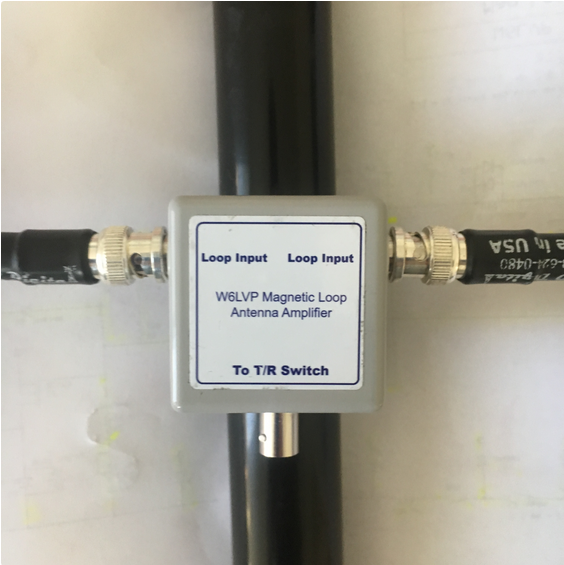 The W6LVP mag loop includes a combination transmit/receive antenna switch and power inserter for the loop amplifier which enables a receive antenna to be easily used with transceivers, such as the popular Icom IC-7300, lacking a separate receive antenna input. The W6LVP loop is equally friendly with receivers or transceivers with receive antenna inputs. The transmit/receive switch supports up to 100 watts transmit power but also works with a separate high-power amplifier. Includes low-noise linear power adapter to generate clean 12 volts for the transmit/receive switch and loop amplifier. Unlike the DX Engineering antenna which requires 24 VAC, power can be easily supplied by 12 volt batteries during portable operation. The W6LVP mag loop transmit/receive switch does not support QSK. I have received many requests for suggestions on which type of coaxial cable to use to connect the loop to the power inserter or T/R switch. When connecting a transmitter to an antenna, cable loss is very important. For connecting a receiver to a receive antenna, common mode pickup on the coaxial cable shield can add unwanted signals and noise. RG-11 is probably best but is a bit more expensive and stiffer. Quad-shield RG-6, which is designed for cable and satellite TV, works nearly as well but is normally sold with F connectors. Either of these cables can be purchased from MPD Digital in custom lengths with male BNC connectors installed. Diversity with a Receiving Loop. I have tested and compared performance of the W6LVP loop against my wire antennas. The Loop does a good job especially on 40, 80, and 160m bands. Amplified loops potentially have a problem with IMD from nearby broadcast stations. With a couple of AM stations only a mile away from me, this has been an issue with my wire antennas. The W6LVP loop I tested included an AM broadcast band HP filter which kept the broadcast band IMD mixes in check. The vertical loop provides polarization diversity when used in conjunction with horizontal dipoles. Used with two receivers, one with the loop and one with a dipole, polarization fading on one antenna will be readable on the other. The W6LVP loop is useful as a DF antenna for tracking down pesky RFI. The amplified antenna is sensitive and wideband, with a strong directional characteristics. I use it with an RTL-SDR dongle and laptop for quantitative walk-around RFI hunting. I mounted the loop 10 feet off the ground and turned it by hand for lowest noise. The provided switch box made it simple to install. I connected it between my Flex and the linear running the RF and the relay line through the switch on its way to the linear. This allows easily switching receive antennas without affecting transmit. Even without the relay line connected the unit protected the pre-amp with only 100 mw of output. I found receive quality and level the same as my much larger Wellbrook loop. When compared with my 204 foot doublet at 57 feet using WSPR on 30 and 40 meters, sometimes the doublet did better and sometimes the loop did better, particularly on low angle radiation. Below the AM band the loop left the doublet in the dust. Being able to switch receive antennas is definitely an advantage. This is an excellent broadband loop. Really helps on low bands. I installed the loop on a low cost rotator about 10 feet off the ground. I ran the loop antenna to the aux receiver antenna input on my TS-590. The signal level from the loop is about the same as from my doublet, but the noise level is much lower. This is most evident on 160 and 80 but still helpful on 40 meters. The improved s/n ratio allows me to copy CW on 160 meters that I can’t copy with my doublet. In addition, on the low bands, the loop can be rotated to null specific noise sources. I’m planning to use the loop antenna for Field Day this year, probably on 40 and 80 CW. This is a high quality unit and it works. Very much worth the cost. 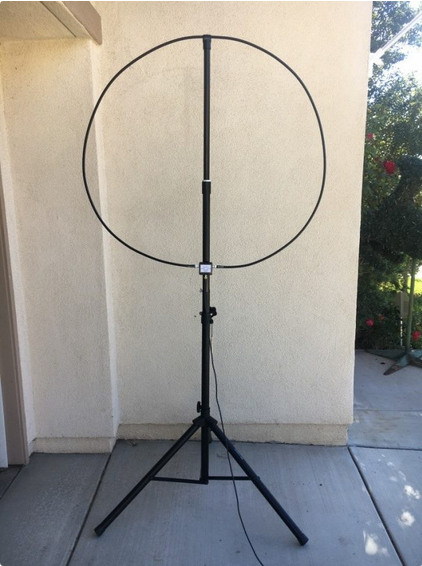 Great low noise receive loop antenna. After extensive testing with WSPR on 15 20 30 40 80 and 160 meters I found this antenna to be equal and in some cases superior to my Wellbrook low noise receive loop. The lower cost and the fact that this product includes a transmit / receive antenna switch box makes it a better choice. The switchbox allows my IC-7100 to work with either a transmit antenna for both transmit and receive or also to instantly switch so that even though my radio only has one antenna port it can be switched to use the loop for receive and my normal transmit antenna for transmit. This allows me many times to hear signals that are otherwise buried in the noise. I love the low noise of the receive loop and the fact that it receives from 2200 meters to 10 meters without any tuning.